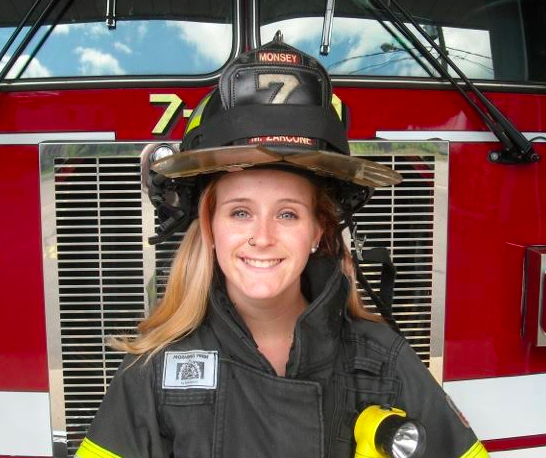 A growing number of women are climbing tall aerial ladders and rescuing Rockland County residents from smoky rooms as members of volunteer fire companies. People who call 911 are not concerned about the gender of the firefighter who responds and rescues those plagued by a fire emergency. With the Personal Escape System (PES) each firefighter carries his own hook, rope and descender pre-rigged on their person for any situation where they may have to bail out a window or off a roof. Their bunker pants have built-in harnesses, so the PES is clipped in and ready to deploy. The SCBA is a respiratory protective device to prevent the user from inhaling the oxygen deficient air, contaminated particulate, toxic gas and vapors or potentially harmful gases at the fire site. In Monsey, multiple-family dwellings consist of apartment buildings, garden apartment buildings and townhouses. These structures can be anywhere from a single story to four stories tall. Life safety is the highest priority at all structure fires. The potential for loss of life and rescue of multiple civilians is prominent in multi-family homes. There is a high chance of fire extension that makes the objective of interior fire containment and primary search a high tactical priority. The rescue problem should be addressed by a thorough interior search for life that focuses on the bedrooms and means of egress. Once those areas have been checked, searching above the fire and adjacent apartments have to be performed. For additional information about volunteering, visit www.monseyfd.org or call 845-356-2611.